Princess Aghayere and the Quakers were no match for Providence. Senior forward Jannah Tucker scored 21 points, but it was not enough as Villanova fell to host West Virginia, 64-57, on Sunday in Morgantown, W.Va., in the second round of the Women’s NIT. Tucker tried to spark a Wildcats comeback in the fourth quarter, hitting back-to-back three-pointers to pull her team to within four points. The Cats got even closer, 52-51, on a 10-foot jumper by Emily Esposito and a driving layup by Brianna Herlihy with 5:16 remaining. But the Mountaineers were able to keep the Wildcats from completing the comeback. Emily Esposito added 10 points for the Wildcats (19-13), while Brianna Herlihy added nine points and a team-high 11 rebounds. The Mountaineers (22-10) were led by Naomi Davenport with a game-high 25 points. Tynice Martin had 23 points and Kari Niblack had 13 points and 16 rebounds. 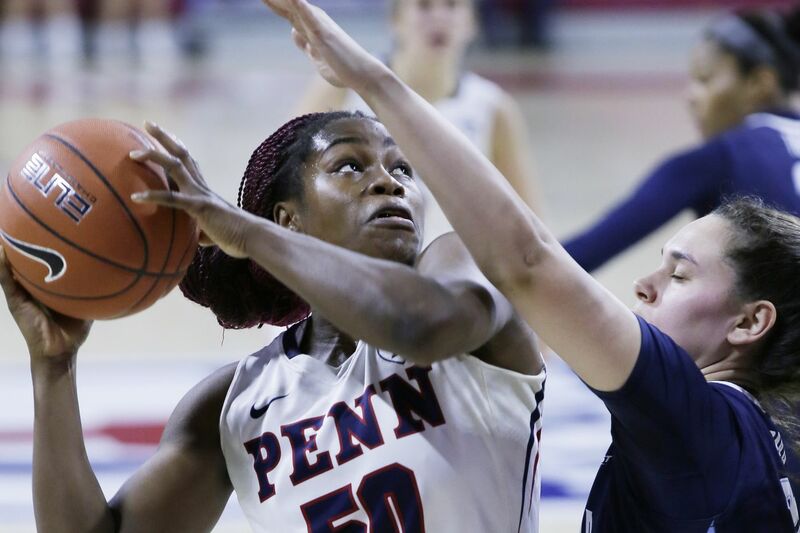 In a game where it seemed the Penn Quakers could never quite find their footing, the Ivy League champions lost, 64-54, to host Providence in the second round of the WNIT in Providence, R.I. Seniors Princess Aghayere and Ashley Russell scored 15 points each for the Quakers (24-7). Aghayere tied a personal best with 12 rebounds for her sixth double-double of the season. Russell added four assists, finish her season with 128, third highest in program history. The Quakers struggled on offense all game, and also turned the ball over too frequently, finishing with 18 for the game. The Quakers had several opportunities to pull even in the fourth quarter, but again were hurt by turnovers, as well as big three-pointers by the Friars’ Jovana Nogic, who finished with 13 points. Mary Baskerville led Providence (19-15) with 20 points.